Sometimes finding a solution to tidy up your house is not easy. The mess will be always there. That is why you need to find the best storage organizer ideas that your house needs. That will help you both in decluttering and organize your house. This page may contain affiliate links. You can read my full disclosure HERE. I don’t know about you but during this time of period where you need to have a party for Halloween, Thanksgiving or Christmas. The thought of cleaning and organizing the house always in my mind. Although I know most of us usually do the purge at the beginning of new year. There is no exact timeline when is the perfect time to declutter and organize your house. If you see that your house is already a mess, then it means you need to organize it A.S.A.P. As simple as that. One of my favorite in the part of organizing my house is to find storage organizer ideas. Whether it’s DIY or buy from a local home store, the purpose of it is still the same. To keep all of your stuff tidy. Here are some storage organizer ideas that I found useful to help you organize your house! We all know, using a basket really help a lot in keeping stuff organize and tidy. My most favorite part in using basket is that when you buy it for a certain purpose such as keeping your cleaning solutions. It can also be used to keep all of the baking trays or other purposes. A basket is the best multi-purpose organizer that you’ll need in your house. There are so many types of baskets and I want to show you exactly what type of basket that you can use to organize your house. If you have a farmhouse setting inside your house, having these type of baskets can elevate the aesthetic of your house and organize it at the same time. You might want to have a perfectly squared basket so you can store more inside. There are two colors that would match your house. Dark-colored rattique storage crates or Light-colored hand-woven storage baskets. Organize your party or kitchen cabinet with these baskets. Wired stackable baskets perfect to store a small number of your cans and cooking seasonings in your kitchen cabinet. Meshed stackable baskets can store larger quantity and perfect for your pantry. Another great option to make more storage space is under the shelf baskets. These stackable under the shelf baskets can be used separately or you can stack it and make some space on your closet. Remember if you want to stack it, better to put something not too heavy. Clear plastic bins can be used in your Pantry, Fridge or Freezer. You can use it to keep your bottled or canned drinks, fruits, bottled cooking seasonings such as sauces and snacks for your kids. What’s great is that it’s durable and some can be stacked. Find one that meets your need. What I mean by containers are jars and plastic containers. Basically, a basket with the lid. Containers are great for separating foods inside your fridge or freezer and dry cooking or baking ingredients. Mostly used in pantry and kitchen but also can be used for other purposes such as keeping your toilet bombs or even your business receipts. Store your sewing supplies in this mason jar pincushions. Before buying the mason jars, you need to make sure which one you want to buy. There is a mason jar with a wide mouth which is perfect to store makeup brushes or your office supplies and one with a regular mouth for organizers. There are so many jars that you can use to store your dry cooking or baking ingredients such as flour, nuts, and rice. Here are some jars that you will found it useful, especially if you need to store big amounts. A great way to use dispenser jars beside for party is for your laundry room. If you are using a liquid detergent or softener, storing it in dispenser jars would be more practical and easier to reach. Huge glass jars are a staple to organize in your pantry or kitchen if you need to store a larger amount of ingredients. Probably you have seen this type of container but if you don’t know about this, I will show you what you can store in these. Organizer your vanity drawer with these set of drawer tray organizers. 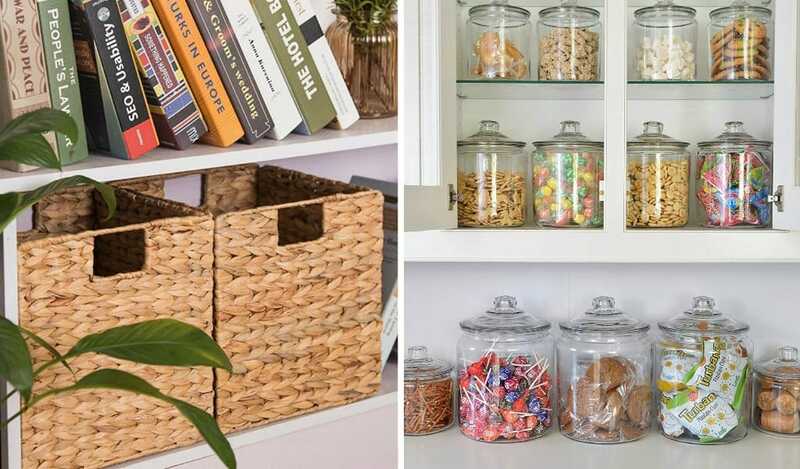 You won’t believe that you can actually buy acrylic containers that looks like a glass jar and one with a square shape like this to organize your pantry. It’s kid-friendly and break-resistant! This is the part where I share some storage organizer ideas that can also be used in any part of your house. You can use pegboards in any room of your house such as in a garage, on your office wall, store your craft supplies, hang your kitchen utensils and manage your necklace in your bedroom. Mounted organizers are very popular these days especially to organize your home office. Organize your documents, paper, and letters with these not so expensive 6-Tier Wall Mount Document Letter Tray Organizer. If you need more storage space for your table, you can try this 5-Tray Underdesk Hanging Organizer. When you need more space, your door would be a great use to mount an organizer rack such as over the door shoe rack and over the door spice rack for your pantry. You need to make some space in your kitchen cabinet or pantry shelves? Why not try these stackable shelves to create more space. I do really hope that these storage organizer ideas can help to declutter some space and tidy up your house. Leave a comment below and share your thoughts on these ideas.